Pandit Bhimsen Joshi, the illustrious exponent of Hindustani classical music of the Kirana gharana, passed away in Pune yesterday. The one and only time I had met Pt Bhimsen was in 1991 in Pune during the Sawai Gandharva music festival. As it happened, I was in Pune yesterday. 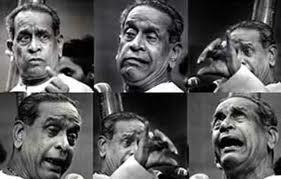 The Sawai Gandharva Music Festival was co-founded by Pandit Bhimsen Joshi. The Sawai Gandharva Sangeet Mahotsav (informally known as Sawai Gandharva or simply Sawai) is one of the largest and most sought-after Indian Classical music festivals in India. Held annually in Pune, Maharashtra since 1953, this festival was founded by the Arya Sangeet Prasarak Mandal and Pt. Bhimsen Joshi, who led and organized each festival until 2002. The festival used to last several nights. Starting at 10 PM, it would last the whole night. As a matter of tradition, Bhimsen-ji would be the final act of the final night. The crowning event of the festival. I was at the Sawai in 1991. Panditji was sitting in the front row among the audience one evening, waiting for the performances to start. I decided to go up to him and pay my respects. I introduced myself. He asked where I was from. I told him I lived in California. He asked, “Do you know Ramesh Mehta?” Mr Mehta was someone that Panditji knew in California. I said that I did not. That gave me an idea. Sitting next to Panditji was the chief minister of Karnataka. I forget who it was. Anyway, I said hello to him and asked here he was from. He said he was from Karnataka. So I asked, “Do you know my friend Prakash? He lives in Bangalore.” Heh, heh. While I am sad that Bhimsen Joshi is no more, I am grateful for the treasure that he leaves behind. His divine singing will live on. This morning I listened to Raga Ramkali by him. He truly was a Bharat Ratna. Have you always been like this only? RT: Joke to K’taka CM. Great man is no more,a true classic whose place will never filled.old is gold.